Well, it might appear that I've fallen into a deep, dark hole somewhere, but appearances can be deceiving. Things actually seem to be looking up around here, though there have definitely been some ups and downs. I'm finally off the prednisone (fingers crossed) and that jumping-out-of-my-skin sensation is starting to go away (and possibly my chipmunk cheeks will return to normal soon!). 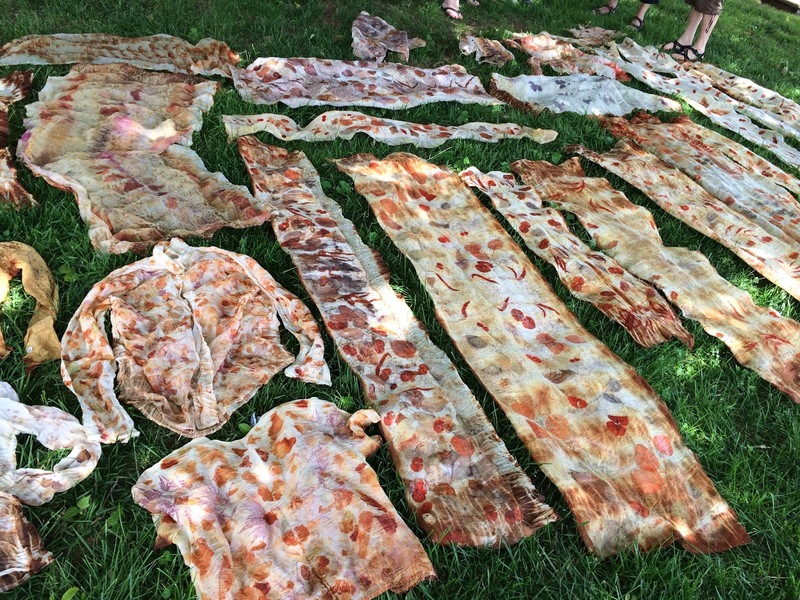 I'm late getting to this, but I promised a short recap of a fabulous eco-printing/dyeing class I took with Nicola Brown the weekend after the Kentucky Sheep and Fiber Festival. Nicola is so much fun to take workshops from that I'd sign up, even if I learned nothing, but learn something, I did! The eco-printing workshop had me nuno felting a scarf (which I've avoided for years and years, because I was sure I wouldn't like it - go figure). 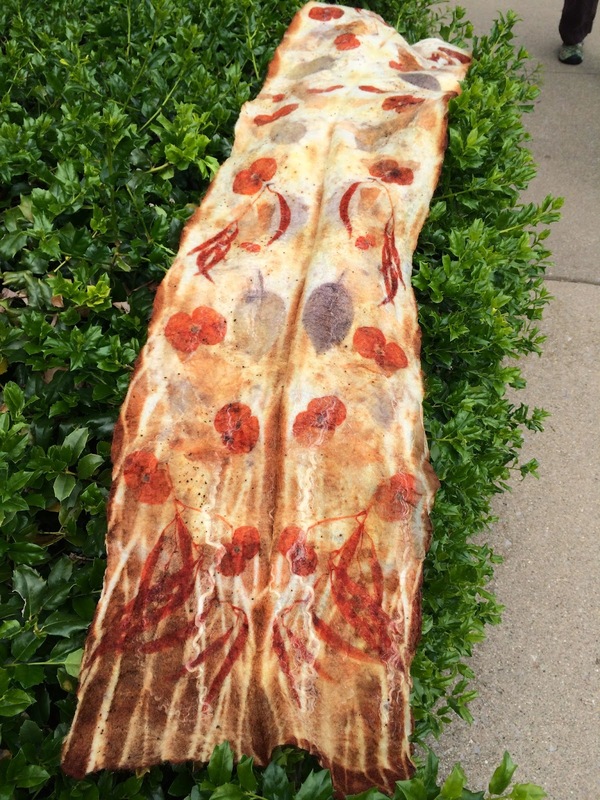 After the nuno felting, Nicola demonstrated how to eco-print designs on the scarf. We used a variety of plant material - certain types of leaves, flowers, even tea leaves, all dipped in rusty water, of all things, and it was thrilling to remove our creations from the dye pots and unroll them to reveal the patterns. It's a bit mysterious and unpredictable and that's part of what makes it so appealing to me. There don't seem to be a lot of hard and fast rules, which is even better. I find myself being drawn more and more to natural dyeing and have been reading up on plant material I might gather here on the farm and down in our creek. There have to be some mushrooms out there that will give color and I'm letting all the pokeberries grow sky high in hopes of harvesting them for dyeing. All those avocados I've been using to incorporate healthy fats into my diet .... bingo! Avocado skins and pits are great for dyeing. I don't consider myself an artist in any sense of the word, but I do love creating functional items and eco-printing allows for just enough creativity to be fun, but not intimidating. It's quite likely Nicola will be back in this part of the world next May to teach some workshops, so keep an eye out for announcements (I'll keep you posted here) and sign up for a fun learning experience. If you're up for travel, you might find her in Ireland, where she lives, Portugal (where she just finished teaching), California, Ohio or other locations here in the US. The lambs are growing, growing and eating voraciously - about 60 pounds every day at this point. That means I need to order feed every single week. I'm grateful that the fine folks at Woodford Feed deliver and the guys will dump out those feed bags right into my feed bins. I need all the help I can get these days! Midgie and Phaedra are still as friendly as ever and a few of the others want quick scratches, but most of them are content to eat their grain and get back outside to their pasture. The pastures are starting to look a little thin around here because we haven't had rain in weeks. I'm hoping that before the weekend is over we'll receive some soaking rains to green things up a bit and give the lambs fresh growth to graze on. What else is happening around here? This weekend we were finally able to get the alpaca boys and llama sheared. Usually, I trailer them over to my friend Lindy's farm. Her shearing day was way back in April and back then I was physically unable to handle getting all my animals in the trailer and hauling them over. I've worried so much about the alpaca boys having all that fleece in hot weather, but have kept a big fan available for them and have sprayed them down with water on the hottest of days. They seem to have done just fine, in spite of my worry. I am really relieved to have that off my to-do list. Meanwhile, this guy keeps watch over everything that goes on here! I am also letting my pokeweed grow! I have to catch myself every time I reach for one to pull it out. Ironweed too. Like I need more things to do. :) Glad you're feeling better. I love hearing about your place. Love those little lambie bottoms at the feeder!! Maybe it's time for Mr. Peacock to find a Mrs.? Happiness is feeling much better than a few weeks ago!! So glad to hear you are off pred - it works, but h.a.t.e. it so. Love your scarf - I've wanted to try that technique cuz it's so pretty and different. All the critters are looking good, and your peacock is too cute :-) Take care! That scarf is gorgeous! I don't have much patience for projects that I can't control the end result of entirely but it is so fun when you can let it go a bit, isn't it? Happy to hear that you're able to abandon the prednisone - still can't believe that you traveled all the way to Squam on your own in spite of all of that stuff and so glad that you did.